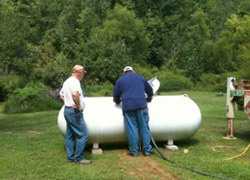 Doke Propane has been providing propane service to residential customers since 1981. We know that safe, dependable and friendly service at competitive rates is what you want, and that’s what we’ll give you. Already own a tank? Call us for our competitive rates and dependable service. If we need to install a tank for you, we’ll make sure to find the place allowed by code. Residential tanks run from 100 gallons to 1000 gallons, and we’ll help you determine which size is best for your household needs. Every year we run a Pre Buy Program that allows our customers to purchase propane at the lower warm weather prices. Due to daily routing schedules, we cannot guarantee same day deliveries, but we promise to get to you as soon as we possibly can. It’s best to call for a refill when your tank is still 15-20% full; a dry tank must be leak tested to ensure you have no leaks in the system. This takes time and there is a charge for the test. The office will is open Saturdays 9 am - 5 pm for regular hours during the winter if you need to get propane cylinders filled. We also provide dependable service to a broad variety of commercial and industrial users in Southwest Missouri. When you need a reliable vendor, excellent service and the best product available, call Doke Propane. 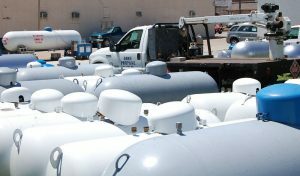 Business propane needs are not usually seasonal, and unlike home needs, can vary significantly from month to month, all year long. We’ll work with you to ensure you have the propane you need, when you need it. 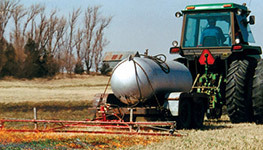 If your farm or business relies on propane, call Doke today.